Running out of space for all of your towels? This metal bar towel clip is an easy way to keep towels in a convenient and easy-to-reach spot. 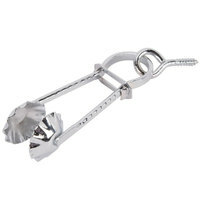 Constructed of nickel-plated steel, this towel clip is sturdy and made to last for repeated use. If you are short on space behind a tiny bar, or simply need a convenient place to find all your towels, this towel clip is for you. So what do you expect out of a piece of metal? I was expecting a very low quality product that would break within days. The Metal bar towel clip has by far surpassed my expectations, the hook is sturdy and the metal tab that tightens the grabber is very thick and durable, I have a feeling that its going to be years before I replace this hook next to my sink. This clip gets the job done. It is simple and for the price it is suitable. It screws in neatly, and the screw seems more durable than the clip itself. I have put up a number of them to make things more convenient in the bar and kitchen area. This is one of those things that will make you ask yourself, "What took me so long ?" If you run a clean as you go operation, this is the perfect complimentary tool. No more scrambling to find a towel when the need arises, thanks WEBstaurant. This towel clip is good quality strong metal material.its screws in to the wall so u can hang it your towel wherever you needs to dry your hand. It's clamp the towel with a strong grip and locks into the place. This does what it’s supposed to do. I wish it was easier to move the bar but it does work. You can buy a better one for way more money if you wanted. This metal bar towel clip was perfect for picking up any kind of steaming cloth for proper cleanup. In my opinion it is a totally necessary tool. while i don't really use these that much in the kitchen (they tend to be more used for bartenders, i think), this clamp / clip is pretty solidly made and comes with a mounting screw so you can secure it fairly easily to almost any wall. We very much appreciate towel clips in our kitchen. We make it a point to wash our hands frequently and having a towel accessible is very handy. This towel clip is easy to install and is very inexpensive. We highly recommend this for your kitchens. this metal bar towel clip is meant to hold a side towel for either wiping your hands, or wiping the bar. it has an adjustable clamp, kind like a pair of tongs, and attaches to a screw or a hook. This metal bar clip is small by design but holds any decent weight towel well. Easy to wash and I keep one in the restrooms. Very handy to have for every day use. Simple to change out towel and very simple to install. Will be a definite thing that I order more of. Hold all your bar towels in one specified area with this bar towel clip, have all your towels in one location and convenient for use. Pretty easy to set up, and for something so simple, it works very well. Just put it up in a discreet area and you won't have to worry about misplacing towels. I got this from here for the price. They seem sturdy and strong. They do the job. Can't go wrong with the price. Will order again! Just a simp,e nice way to keep a bar towel on hand. Just install it and clip a towel on and it's easily accessible when needed. These actually came in real handy, although I did not want to screw them in we used them on the sink and just put the screw part on our plastic drain rack that had holes. This towel clip is the handiest thing ever! We no longer worry about misplacing the bar towel. It's easy to use and is strong enough to hold multiple towels at once. Great buy! A neat little gadget. We hung the Metal Bar Towel Clip on the edge of the pizza prep table so we would always have a clean towel handy. Very good value. well made little tool. It does a great job holding a bar towel tightly, yet is easy to release to change it out. Will buy more of these. We have received the metal towel clip from webstaraunt and enjoy using it! It makes our store look a whole lot neater than towels folded up lying around. Great, basic metal bar towel clip. The slide is very easy to use, and the towel does not budge, once clipped. The screw is also very sharp, and easy to use! Nice quality, useful little item for hanging towels instead of draping them over things and losing track of them. The clip works really well, if a bit sticky to it's hard to use one handed. These things are great! I'm about to order a bunch more of them. I do wish they were a little easier to open and close but the great price and not have towels hit the floor makes these one of my favorite little towel hooks. We have switched all of our towel holders over to these little guys. Very cheap but yet makes the space holding the towel look very professional looking. Behind the bar, in the kitchen, or at home these metal bar towel clips keep your counter towels in easy reach. They are convenient with a good price. Love my bar clips, infact I have even put one next to the sink in the bathroom. Granted I change it often but I know no one is gonna pull down towels that I have up for display. These are great to have around the bar and in the kitchen. It looks so much nicer than having a towl laying around. Our only complaint is that some didn't close correctly upon receipt. We were tired of looking for towels! We placed a few of this bar towel clips on our coffee bar and the search is over. Great product and easy to install and use. This little clip has been a great help. No more scrambling to find a towel when you're in a hurry. Easy to install and really a quality item for the price. This towel clip works well because it actually clips to the towel. It helps that you don\'t have to carefully place a towel back on a hook or even worse have it accidentally fall on the floor. This is one of coolest gadgets I've ever seen, and is really hard to get at a local cooking store. I remember seeing this item at my grandfather's bar years ago, and if you give one to someone as a gift it's hilarious watching them guess what it is! But if you need a towel hanger in a space too small for a towel bar, or in many small spaces such as a shop, multiple work stations, a boat or even an R.V., this nifty clip is indispensable. Simply screw in the eye-hook, place the towel in between the two shell clamps, and then slide down the ring 'til it's snug! A great tool from yester-year that is just as handy today. This metal bar towel clip is great for installing under a counter on the bar for keeping track of towels with ease! So affordable you can buy more than one!! They hold towels tight and have a chrome like shine to them. You can't beat them for the price and they hold up well under heavy use! These towel chips are perfect for our resturant and worked so well I am buying more to add to my work shed in the back. Highly recommend this product and highly recommend the price here. I allready own one of these, and now im coming back to purchase many more. They are great, durable, cheap, and help keep our towels off of areas they are not suppose to be. Great price here, buy some from this website only. more expensive everywhere else.